Examples, solutions, videos, stories, and songs to help Grade 4 students learn about conversion between Decimals and Fractions. 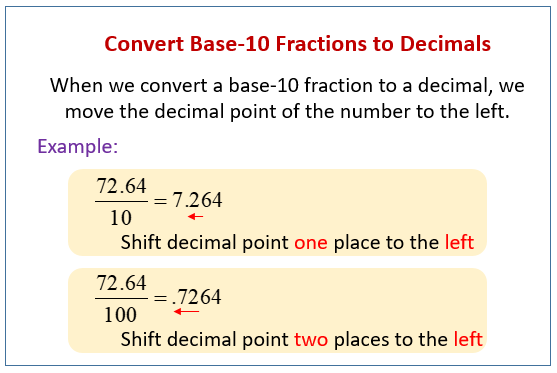 The following diagram gives some examples of converting base-10 fractions to decimals. Scroll down the page for more examples and solutions of converting between fractions and decimals. How to convert base-10 fractions to decimals? How to convert any fraction to a decimal? We can use division to convert any fraction into its decimal form. The video clearly illustrates the 'long division' algorithm and also teaches the notation for expressing repeating decimal answers. Learn how to change any decimal value into its fraction equivalent in lowest terms. Review decimal place values in the process and how to reduce to lowest terms.